The magical, unpredictable season for the expansion Vegas Golden Knights is continuing as they advanced to the final round of the Western Conference playoffs. The Vegas Golden Knights are going to the Western Conference Finals! They are after all an expansion team of misfits who came together to not only win their division, but had the second best regular-season record in the west. In this game Marc-Andre Fleury was able to grab his fourth playoff shutout, and it couldn't have come at a better time. Game 6, leading the tough San Jose Sharks three games to two is the perfect time to shut out your opponent. Fleury made 28 saves and four were made by the net iron. That's right... four shots rang off the post/crossbar behind Fleury and when that happens you know it's going to be a good night at the hockey rink. The two teams were waiting for the other to make a mistake and give up the first goal, but it never happened. Martin Jones stopped 12 Vegas shots, while Fleury kept 11 shots out of his net... 13 if you count the two his friend the crossbar kept out. Tomas Hertl rang one off the cross bar, as did Brent Burns on a blast from the blue line. It seemed San Jose wasn't going to catch a break in this initial period. There was a no-goal call on a scruff in front of Jones which was determined to be a no-goal when the puck was pushed into the net... along with Jones and went in after the whistle had been blown. The Vegas Golden Knights are an opportunistic team. When Marc-Edouard Vlasic turned it over in his own zone with some help from William Karlsson, the puck got to Reilly Smith who saw a breaking Jonathan Marchessault and it was 1-0 Vegas. Then at the 15:38 mark Nate Schmidt gave his team a two-goal lead with this rocket of a shot which was reviewed and determined it was a good goal. The puck actually hit the crossbar and deflected down hitting the camera and came out so quickly it looked that it may not have gone in... but it did to the Sharks chagrin. With the way Fleury has been playing and the excellent defense demonstrated in front of him, Vegas felt pretty good going into the locker room with a 2-0 lead in what could be the deciding game of the second round series. The Sharks do know the way to San Jose, but were hoping to be heading back to Vegas for a deciding Game 7, but the Golden Knights ruined that idea. 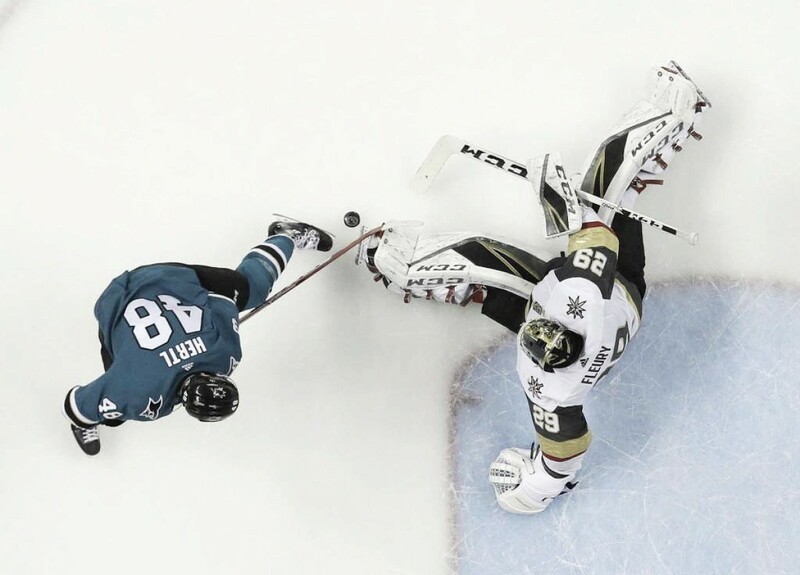 The tight defense and Fleury's stellar play in net gave the Vegas club the deciding Game 6 when Cody Eakin ended San Jose's season with an empty net goal at 18:09. The Sharks' bite was not enough to pierce the strong armor of the Golden Knights. The final score of 3-0 was a dramatic ending to the second round matchup for the Vegas Golden Knights. They now await the winner of the Winnipeg Jets/Nashville Predators series with the Jets in a comfortable three-game to two lead. Whomever the Golden Knights play, it has been a season to remember... and it's not over yet. Do you have words to express the season the Vegas Golden Knights are having? Do you feel they have every chance to move on to the Stanley Cup Finals? Let us know in the comments section below. Arizona Coyotes: Is a climb up possible with bodies back in the lineup?